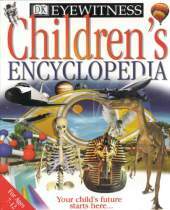 This encyclopedia breaks the mold by presenting creative 3D landscapes which transport children to virtual worlds - from the rain forest to the inside of the Earth, from their backyard to deep space - in which every scene and object is linked to exploring a child's natural curiosity of the "how" and "why" of their world. The encyclopedia is extensively cross-referenced and you can leave "sticky notes" on screens as you go along so you can go back to favorite sections. Far more than a collection of information, it's an absorbing interactive experience that teaches by letting children explore the world.